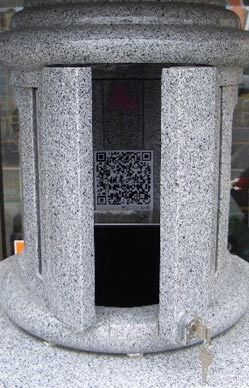 Somehow we missed this news from Ishinokoe (or “voice of stone”) who announced that they will begin offering tombstones with a unique QR code. The package will allow visitors to access a dedicated mobile site, complete with life history and photos etc., of the deceased. They also note that for the sake of privacy only people with a key, family members, will be able to open the chamber door in order to scan the data. The sample QR code included with their press release points Here. The service apparently comes bundled with the companies granite and marble markers, estimated cost approx. $10,000, plus a monthly admin. fee of $50 for the first three years. 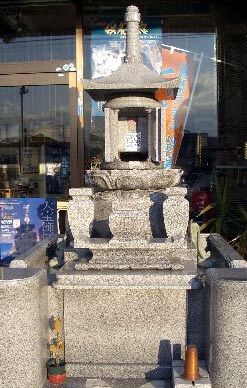 The conclusion of the companies statement also notes; “it is expected to become a new style to which it visits a grave for the young generation.” As a starting point, there just might be something to that. The DailyBuzz featured this article, calling it “like a Facebook profile for dead people”..